I’ve given myself a few BIG projects to do this month (this was one of them) so blogging has taken a little bit of a backseat. I’m planning to post just once a week for a while whilst I get sorted out. Hopefully that’ll mean better (but just less frequent) content! 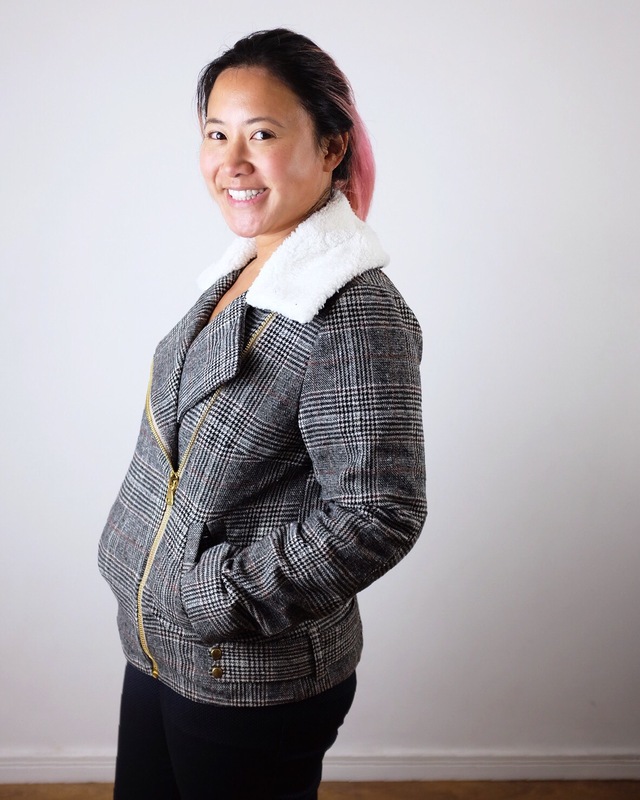 For November’s Minerva Crafts make I made the Harriet Lumberjacket by Named Clothing. It’s been on my sewing list for a while now but I’ve only just racked up the courage to actually make it! The Harriet Lumberjacket is an oversized biker jacket. It’s got an asymmetric zip and wide collar. It is fully lined and interlined as well for extra warmth. It features little belt tabs on the sides with popper buttons and elbow patches. It also has 2 double welt pockets. In addition to this I added in an internal pocket and a hanging tab at the neck. 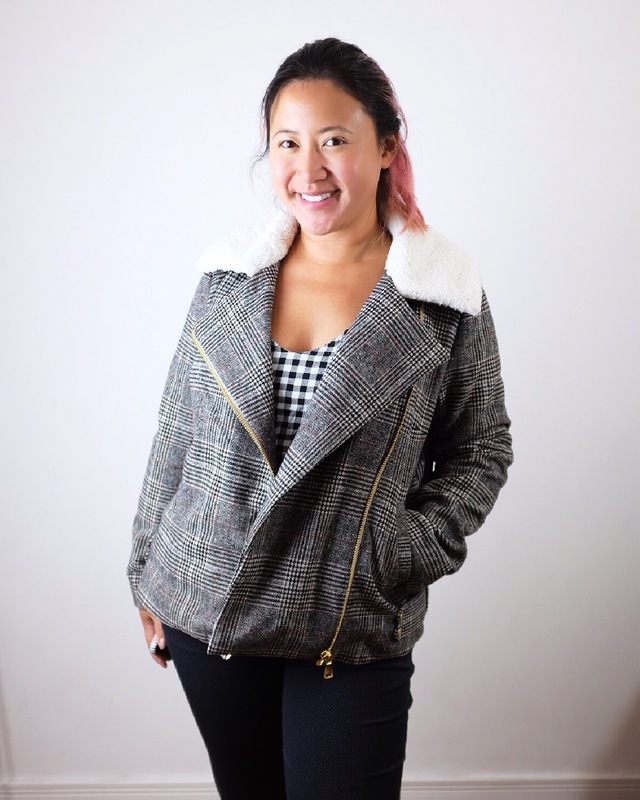 If you’ve ever wanted to make this jacket, now is the time! This style is all the rage this winter! It’s got the perfect balance of warmth and casual style which I love. 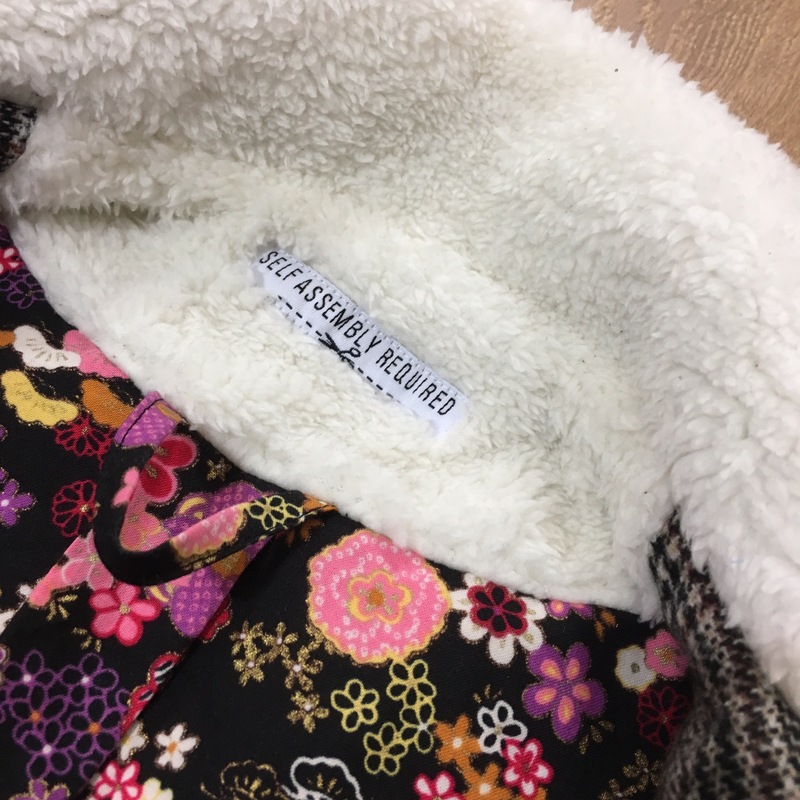 Named recommend using a medium to heavy weight wool coating and a faux fur contrast and to my luck I managed to find both with Minerva Crafts! I opted for a wool with a large plaid pattern in a beige/brown colourway and a teddy bear faux fur in a contrasting cream. A classic combo! I used some sew in Vilene interfacing as my interlining. You could use something thicker for more warmth though. 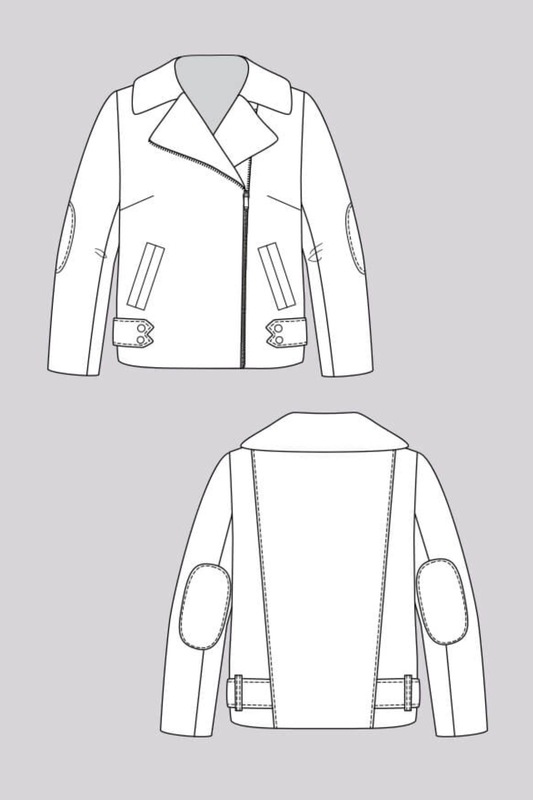 I also chose not to interline the sleeves of my jacket as I was worried it would make them too stiff and boxy. If I’d used a softer interlining, I think I would have preferred to have the extra layer! I used a patterned cotton from my stash (I bought this one in Singapore in fact!) for my lining. The zip and poppers I got from eBay which does tend to be my go to place for hardware. This pattern requires a lot of fusible interfacing as well so don’t forget to add that to your shopping basket! Named Clothing like to reinforce all the seams on their coats so I ended up adding fusible interfacing to nearly every seam. I ignored the bit on the sleevehead. I was concerned this would make it too difficult to ease the cap in. The hope is that all this extra reinforcement will help to produce a more hard-wearing garment that can be worn for years! I’m really pleased with how all my pattern matching turned out! I could’ve tried to match up the sleeves too I guess but to be honest I didn’t mind as long as it was all symmetrical! The only thing I kind of wished I could change about this make would, perhaps, be to use a thicker thread to topstitch. I think it could do with a little more definition, especially on the back seams and the elbow patches. It got a little lost in all that plaid! Here are some close-up details! The best tip I could ever give in the coat making process is to take it one step at a time! The way these instructions are laid out mean that as long as you don’t rush ahead and get overwhelmed, it’s very easy to just follow step by step and achieve the coat of your dreams! 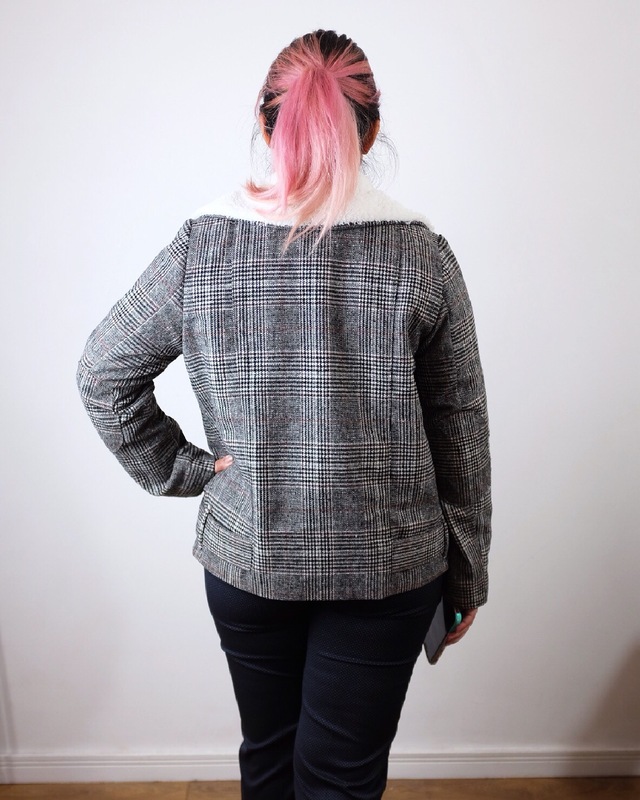 It took me about a week of slow sewing in the evenings in order for me to finish this jacket. It was definitely worth taking my time and doing each step to the best of my ability because I am in LOVE with the result. I’m really proud of how it’s turned out! Thanks! I wasn’t sure about the gold to start off but I’m loving it as an accent now! I’m really appreciating taking the time to do things well as opposed to what I normally do when I’m always rushing to finish something!! That’s such a beautiful jacket! Where did you get your personalized tags? Thanks! Those tags are from the Dutch Label Shop. They’re a bit pricey but excellent quality! Wow, that is a masterpiece! Congratulations! Emily your jacket is gorgeous! You should be over the moon – when people compliment you on such a beautiful jacket, how wonderful it will be to say, “Thanks! I made it!” Love your zip, collar, the belt – everything is just such a professional finish. 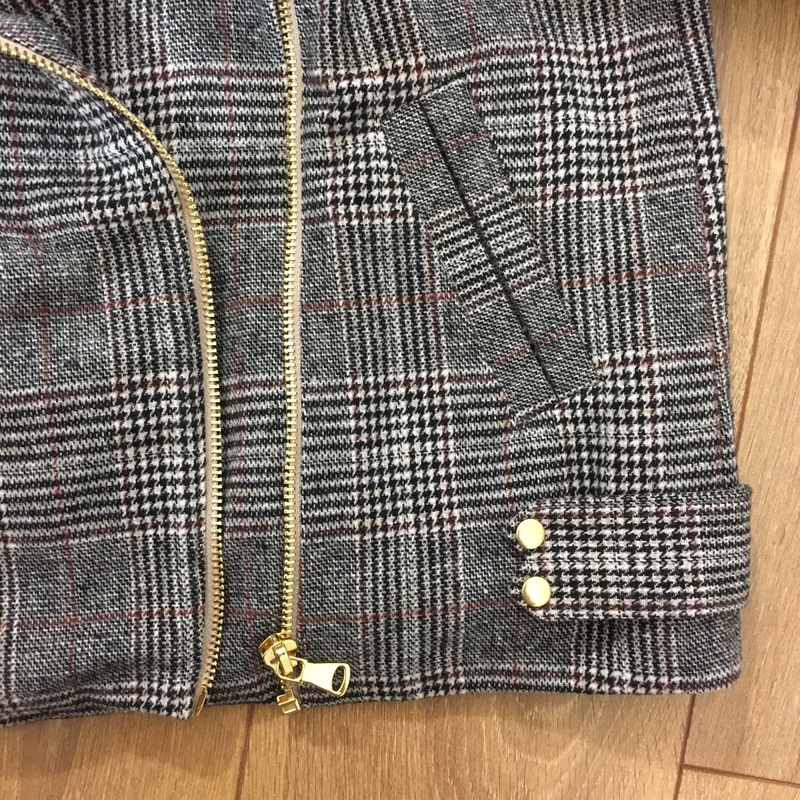 REally nice jacket and super craftsmanship (Craftsgirlship??)! You must have used a clapper to get such sharp looking edges. Well done Emily, you look great in it. Lol. My clapper is used for everything nowadays! Don’t know how I lived life without one! This is gorgeous! I’m amazed at how professional it looks. Great job! I’m heading over to buy some of that sherpa fur, it looks so snuggly. Oh that fur is so lovely. You just want to sink into it! I am in complete awe of this jacket. It is my fantasy winter jacket. It looks fabulous! Beautiful! You got a very professional result, and I love the gold hardware you used as well. Hope you enjoy wearing it–it looks fantastic! Oh man, you should be! It looks so unique and professional!